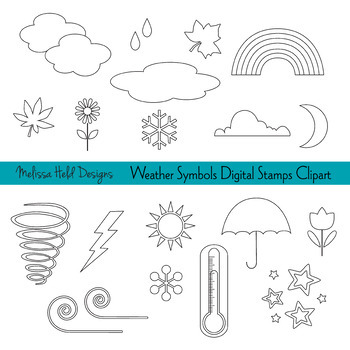 This is a digital stamps collection of weather and seasonal icons in black outline by Melissa Held Designs. These illustrations will be useful for school science projects, teaching resources, coloring, and activity books. Icons include clouds, raindrops, rainbows, lightning bolt, sun, moon, stars, thermometer, snowflakes, sunglasses, umbrellas, wind, leaves, spring flowers, and tornado funnel. This includes 19 PNG files on transparent backgrounds.